The Birdwing Open Air Classroom was officially dedicated May 13, 2014. The San Dieguito Lagoon is the western gateway to the San Dieguito River Park. It is the site of a massive tidal wetland restoration undertaken by Southern California Edison as mitigation for fish impacts associated with the San Onofre Nuclear Generating Station. There is a great deal to be learned by all ages at this site. 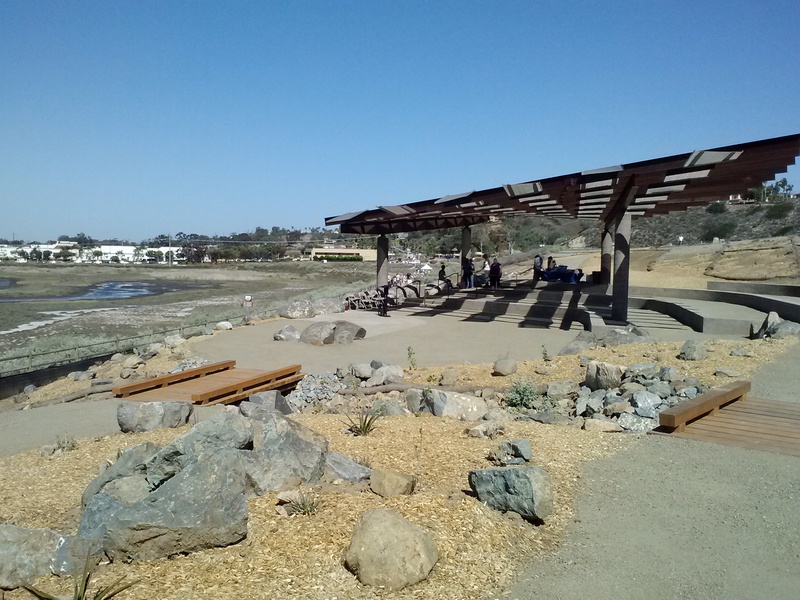 The San Dieguito River Park received grant funds from the County of San Diego at the recommendation of then-Supervisor Pam Slater-Price to construct a Lagoon Trailside Open-Air Classroom (later named the “Birdwing”) that would provide the means to do that. Additional construction funding was subsequently received from the County at the recommendation of Supervisor Dave Roberts. 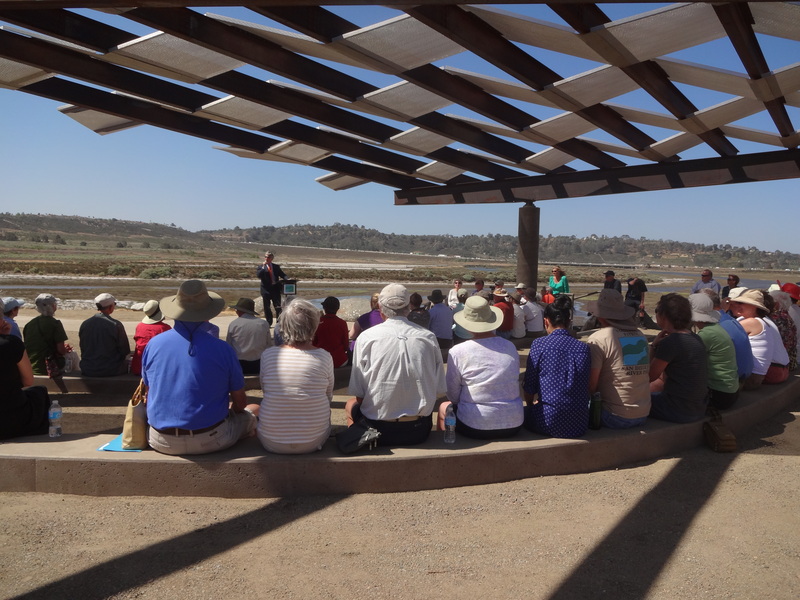 The San Dieguito River Valley Conservancy, a private 501(c)(3) organization, provided the funding for the design of the structure. 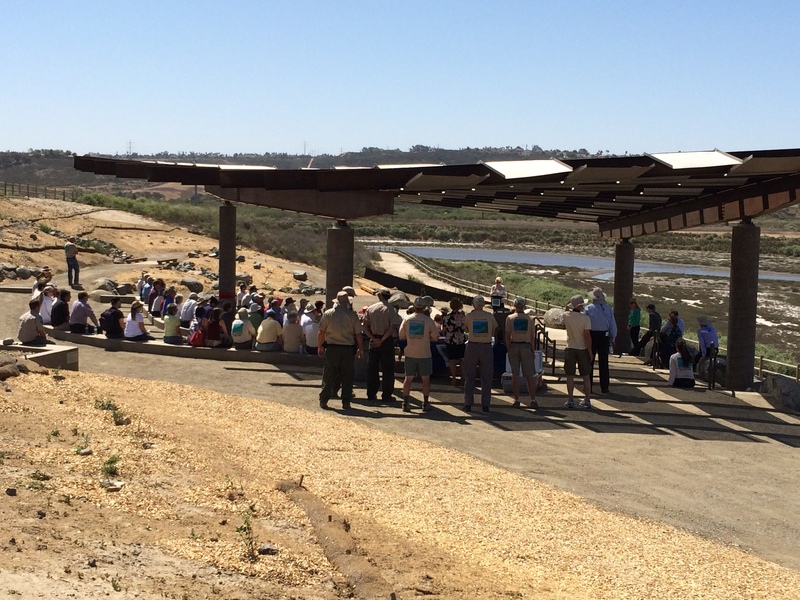 The Trailside Classroom provides a facility for San Dieguito River Park rangers or teachers or Coastal Commission scientists to gather students to teach about wetlands and their importance, aquatic species habitat, migratory birds, effects of climate change and much more. From the Trailside Classroom, students can be led out to the lagoon or Treatment Ponds for further learning activities. The Trailside Classroom can be used as a venue for adult lecture series on these same topics. When it is not being used for student groups, the Trailside Classroom is a place where visitors and trail users can rest, enjoy the view of the lagoon, watch birds, and meet friends. The Birdwing Open Air Classroom has curved, concrete benches built into the slope bank overlooking the San Dieguito Lagoon. A rock-lined arroyo crossed by two wood bridges is on one side of the Birdwing; the other side is framed by large boulders. Shade is provided by corten steel beams and stainless steel panels held aloft by 4 concrete columns. The structure seats approximately 80 adults. It is accessible, including for ADA purposes, from the Coast to Crest Trail. Parking is provided at a nearby staging area as well as along San Andres Drive. Location: On the slope south of Via de la Valle, overlooking the lagoon, adjacent to future Lagoon Center. This property is owned by the San Dieguito River Park JPA.